When you really think about it, your life isn’t so much a story with a plot as much as it is a work in progress. It only becomes a story after time passes, after death. When you find yourself in the moment, life is not “set.” There’s only the “now.” Ultimately, we are not in control of our own narrative. Perhaps that’s why we appreciate the storytelling technique, whether it be for books, movies, or television; as storytellers, we are in control of every aspect of our work: story, direction, characters, dialogue, setting – you name it. The same can’t be said for our lives. When people talk about why they watch movies, the words “escape from reality” often pop up. That being said, why watch films about life, about reality, when we want to escape from it? I can’t speak for everyone, but I think it’s because those films remind us of ourselves, the human condition. That is what we all share in common, is it not? Capturing the very essence of life is a task that few films take up, a task that very few of those accomplish, and Boyhood is one of them. 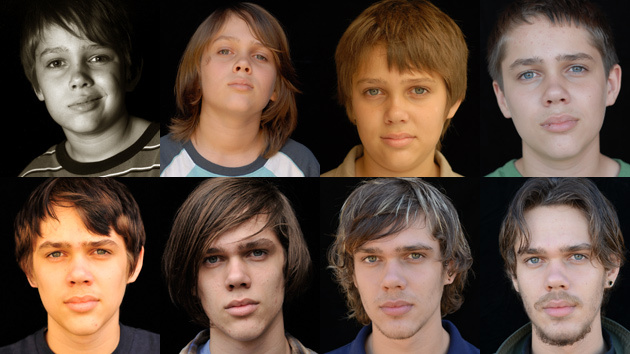 The biggest talking point about Boyhood is how it was filmed over the period of 12 years with the same cast. That there means sheer dedication and patience, and who else but director Richard Linklater would meet the challenge and come out on top? This is the same man who made Before Sunrise, Before Sunset, and Before Midnight (the greatest film trilogy of all time, in my humble opinion) in the space of 18 years, with 9 years between each film. 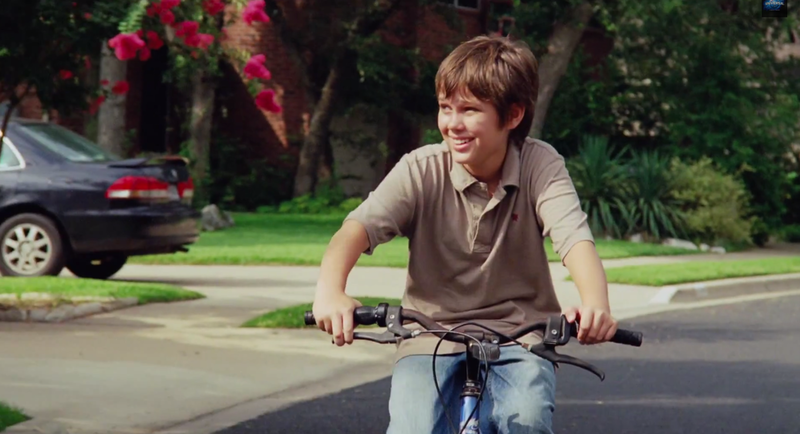 With Boyhood, Linklater has crafted a film that is as heartfelt and mature as the Before trilogy, but also stands out as an epic – it’s clearly his magnum opus. Ask me what my favorite film genre is, and I’ll say science fiction. However, ask me what film genre I value most, and I’ll say coming-of-age stories – the Before trilogy and Stand By Me are obvious choices. Personally, what I hold in high regard the most in my relationships with other people is maturation, and I’m not talking about the development of a Goody Two-shoes. No, I’m talking about the development of one’s sense of the world and his/her role in it, about the development of interests and core values. 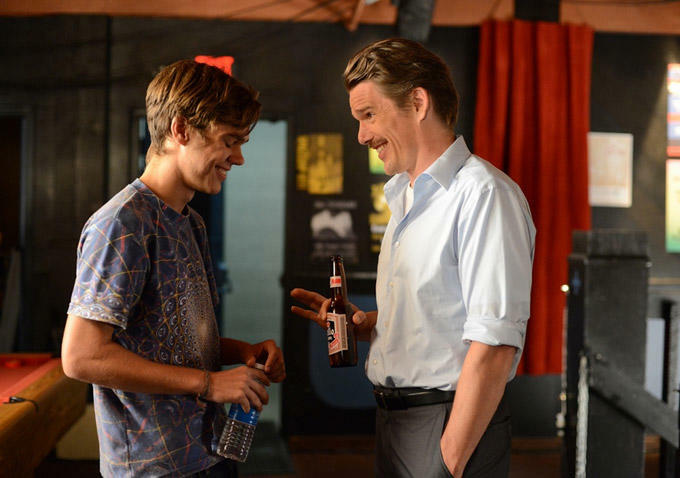 Boyhood is a portrait of that maturation, and since the actors (and thus the characters) are aging in real time, the changes they go through are much more pronounced and really hit home. Although the film is called Boyhood and thereby focuses on the character of Mason Jr. (Ellar Coltrane), it uses the moments he shares with his sister Samantha (Lorelei Linklater), mother Olivia (Patricia Arquette), and father Mason Sr. (Ethan Hawke) to show how they are all growing together. The results are incredible; because they are all aging in real time, with the children growing taller and the parents developing fine lines and wrinkles (in addition to graying hair), we too are growing with them as they become increasingly aware about the reality of their lives, and the process is reminiscent of following the same group of characters in a series of novels. And what great depth they go through! Each cast member here (particularly Arquette) is on the top of his/her game. Not once do we feel like they’re trying, instead being relaxed and naturally going with the moments with each other. This is onscreen chemistry at its finest, and it’s so easy to become attached to their characters. It’s no question that I absolutely love the film, and part of it is because of how much I could relate to Mason and what he experienced. Although I am about 6 years older than the character, I too know what it was like to grow up in a post-9/11 America and during the McCain v. Obama presidential race. I too waited in anticipation for new Harry Potter books, heard Britney Spears and Lady Gaga songs (the film’s chronological soundtrack brought back memories), and spoke with friends about whether we’ll ever see another Star Wars film. In a sense, I saw glimpses of my own life in Boyhood, making it feel like I was watching my own autobiography unfold. The film’s storytelling holds plenty of surprises for, well, a story that basically is comprised of short vignettes. It did take me a few minutes to get used to, but once the years start to pass by, I was drawn in and immediately got hooked. It’s amazing how normal Mason’s life is, not unlike my own and perhaps yours as well. There aren’t many dramatic moments, and even when there are and begin to get tense, Linklater chooses not to embellish them and instead moves forward. That is intelligent filmmaking, a classic example of showing and not telling that respects the audience. What he chooses to show is enough for us to reach our conclusions regarding the characters’ emotions and the changes they’re going through. To some, a story that’s just made of ordinary moments doesn’t sound compelling. Besides, we do tend to love the extraordinary for our fiction. But, as one conversation in the film goes, a girl says to Mason, “You know how everyone’s always saying, ‘Seize the moment’? I don’t know, I’m kind of thinking it’s the other way around, you know, like the moment seizes us.” To which Mason responds, “Yeah, I know, it’s constant, the moments, it’s just – it’s like it’s always right now, you know?” That’s just one of the many scenes in the film where the characters, the story, addresses us as human beings. 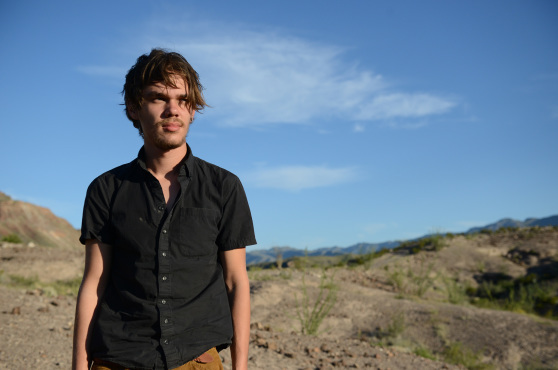 Boyhood is a film about coming to grips with life, the moments, the now – something that we all go through. I’m not saying that it provides the clear-cut “right” answers, but that it encourages us to look at ourselves and see how we look for the answers. That’s what makes it compelling and worth watching. You’ve probably noticed by now that I haven’t exactly written a standard review of the film than I did a post about the ways it engaged me personally. That’s the trick with films like this – films that delve into life itself. They’re meant to engage you directly, and the best way to “review” them is to write how it engaged you and led you to self-reflect. 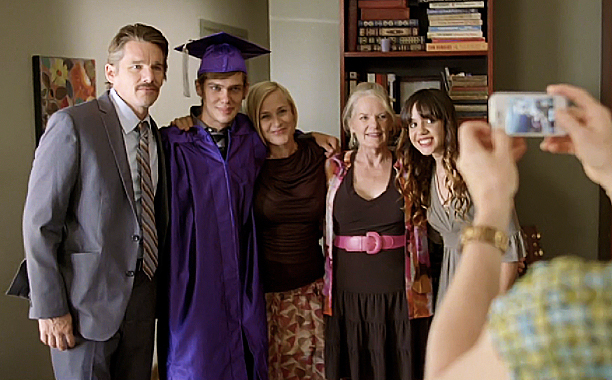 For me, Boyhood touched my soul, and I firmly believe it’s a film that I will grow with, from now to adulthood to parenthood and beyond, and come away with something different with each subsequent viewing. The film is a masterpiece, plain and simple, and it’s not just because it’s such a technical feat – it’s a human experience unfolding on the screen. I don’t think there will ever be another film like it. * All photos courtesy of IFC Films. This entry was posted in Movies on August 1, 2014 by Jun I.